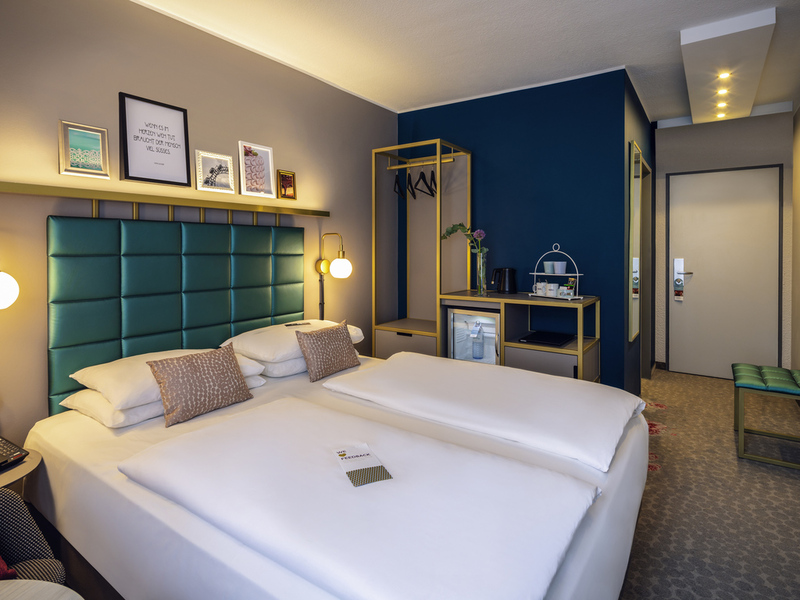 The hotel Mercure Wien Zentrum is situated right in the historical heart of Vienna - a phenomenal central location, pulsating with the city's business and cultural life. St. Stephen's Cathedral, the State Opera House, Hofburg Imperial Palace, Museum Quarter and exclusive shopping streets are all within walking distance. The ideal location for a perfect stay: modern Privilege and Standard Rooms, customer-tailored service with that Viennese charm and world-famous Viennese cuisine. There is plenty to see in Vienna: from magnificent baroque buildings to "golden" art nouveau architecture, over 100 museums and more than 27 castles! We give you the key to the city and will be happy to draw up your own personal Vienna tour guide! Choose between the stylish Standard Room or the Privilege Room with extra facilities. MyRoom by Katharina: May I have this dance? MyRoom by Edina: A Viennese "Melange"
We spoil our guests with our range of delicious Austrian and international dishes. Our specially selected wines are the perfect complement to your meal. Our bar is open daily, with a cozy beer garden in summer. Sit back and relax with selected wines, international spirits, as well as cold and warm dishes. I am always happy to stay at Mecure Zentrum, and have done so many times. I mentioned to your desk staff that I was unhappy with the sliding shade on the window. I could not adjust it. My first stay at this hotel. Good location in principle but currently in a construction zone - work starts at 7 AM. Friendly service. Good breakfast. Very satisfied with the hotel accommodation and breakfast. Great location close to Schwedenplatz transport links and easy walking distance to “must see” sights such as the Cathedral, Spanish Riding School, Mozart’s apartment etc. It was warm during our visit in late March / early April and unfortunately the air conditioning wasn't working for most of this time. This meant having to compromise between having an uncomfortably warm room during the night or opening the window and suffering the very loud external noise. Staff were superb; very helpful and friendly. The stay at the hotel was comfortable. I have my days more confortable, I was betraited as the unique guest, received a benefit of privilege bedroom and felt in home. As regular guests, we, again, enjoyed staying in the hotel. Less relaxing this time unfortunatley due to the noise from the heavy work going on in the street just outside of the hotel So our stay was not as pleasant as usual due to facts independent of the hotel itself. But &quot;we will be back* for sure. Rooms were too warm, no aircon available. Needed to open window but then lot of street noise. I stayed at this hotel 2 years ago and loved the location but not the fact that there was construction going on all around. I thought for sure it would be finished by now but I returned to the mercure Wien zentrum to again find it in the middle of a construction site! Staying in Mercure is generally an enjoyable experience. There are occasionally problems but this is nothing big. We liked the room, the staff were nice. There was building work outside which was very noisy even with the windows shut. Stay for one night here, great location close to bus stop and train station and easy to find the hotel if you arrive by public transport, walking distances to tourists spot, friendly staff, clean and spacious room.